According to a recent study from LexisNexis® Legal & Professional of 450 small law firms ranging from 1-20 attorneys in size, those firms cite underearning as their number one pain point, missing out on average 40 percent of their actual billable time, due to inefficient billing and time tracking practices. To alleviate this burden, LexisNexis today announced the release of its latest LexisNexis Firm Manager® online practice management software with powerful new features, such as productivity reporting and role based permissions enabling attorneys in growing firms to enforce better control and privacy over their firm’s data and task delegation so they can focus on the all-important task of business development. This takes the LexisNexis Firm Manager software from a mainly solo/small-firm solution to a viable choice for larger firms as well. For attorneys who are just starting out or looking to manage smaller firms in a more centralized, mobile and secure way, there is an introductory Starter option. The Starter package includes features and benefits needed for solo attorneys to effectively manage and grow their practices, such as easy client invoicing and time expense tracking, to ensure all billable time is accounted for, as well as Google Calendar™ and Microsoft® Office 365®™ calendar synchronization across all devices. For larger law firms in a position of growth or who want insights to make better informed business decisions related to productivity and billing, there is a more robust Essentials package. Essentials includes all of the functionality included in the Starter option, as well as advanced features needed for growing firms, such as: role based permissions, productivity tracking, forward-looking matter and budget planning, custom client checklist and matter intake templates, as well as Quickbooks™ and Quickbooks™ Online integration. These new offerings are part of a new “More Power to You” focus that lets attorneys better align their technology to meet their specific client and business goals and focus more on what they do best: practicing law. Matter Management- Attorneys can visualize and track matter progress with dashboard views of the firm’s activity. Related contacts, notes and events are tied together in a centralized, mobile and secure environment. Calendar Synchronization and Scheduling with Google and Microsoft Office 365- Eliminates missed meeting and bar complaint worries around important deadlines, court dates and meetings via automatic updates and synchronizing across every device. Configurable Invoicing with Accounts Receivable and Billing Dashboards- Caters to the special billing needs of attorneys and helps firms get paid faster by providing a bigger-picture view of how and where money is coming from. Trust Account Tracking- Alleviates stress related to commingling of client/attorney funds. Document Management- Saves attorneys up to 180 hours a year with instant search and locate and unlimited online storage for all their files and documents. Productivity, Billing, Accounts Receivable and Trust History Reporting- Leverages the firm’s data and empowers attorneys to make more informed business and client decisions. These reporting tools also empower attorneys to evaluate other key metrics to improve profitability without billing more or raising rates. Role-based Permissions- Controls data access among staff adding extra privacy and security for sensitive information and streamlines task delegation so attorneys can focus on business development. Integrations with PCLaw® Software, QuickBooks and QuickBooks Online Integration- Increases billing and accounting insights with the financial management software, QuickBooks, used most by solo & smaller-firm attorneys. Customizable Checklist and Intake Templates- Sets client expectations with informed matter planning via customizable intake templates and checklists. In addition, different areas of practice (AOPs) can be set up to meet different needs. Firm Manager is an award-winning cloud-based law firm practice management tool especially designed for small law firms – and is backed by one of the most recognizable and trusted brands in the legal community. 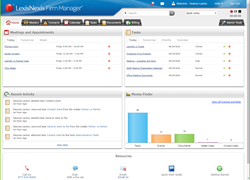 To request a demonstration, learn more, or start a free trial of the product, please visit: http://www.firmmanager.com. LexisNexis Legal Software Solutions provides law firms and legal departments of all sizes with world class business of law and litigation software tools. Our innovative software and mobile solutions include competitive solutions for eDiscovery, case analysis and presentation, enterprise legal management (ELM), customer relationship management (CRM) and practice management.